During severe storms and weather events, power outages can be the least of a homeowner’s problems. 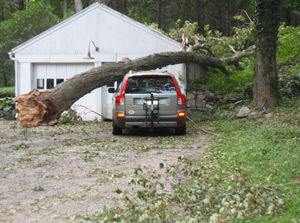 When high winds come into play, the damage it leaves behind requires immediate attention. United Services is ready to help home and business owners who are in need of wind damage repairs to their property. Our quick-response disaster restoration teams have the training and expertise to safely handle and solve all problems caused by wind damage. 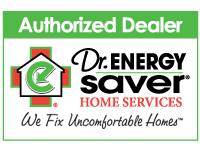 Contact us for emergency home repairs, wind disaster repair and restoration in Highland Park, Lake Forest, Wilmette, Evanston, Kenilworth, Lake Bluff, Skokie, Janesville, Des Plaines, Palatine, Mount Prospect, Winnetka, Golf, Buffalo Grove, Crystal Lake, Wheeling, Glenview and the surrounding Illinois & Wisconsin areas. Just because you have to wait for utility crews to removed downed power lines doesn't mean you have to put off emergency repairs to your home and property when severe weather occurs. Tarp protection. With a variety of sizes on hand at all times, we have the right tarp to cover your damaged roof and provide temporary protection from the weather. Board up repairs. When wind takes out windows or skylights, it’s often necessary to board up the area while the disaster repair work gets underway. Combined with a tarp, this offers homeowners extra protection to avoid any further damages. Repairing damaged roofs. 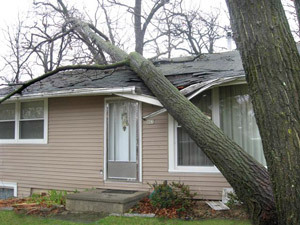 In most cases, there’s no need to call in a roofing contractor to repair roof damage. United Services offers roof repair services, from patching holes to installing new roof shingles. United Services provides emergency service 24-hours a day, 365 days a year with IIRC Certified personnel. Our fast response helps you to minimize damage. Call 1-855-838-3925. United Services is an affiliate of Disaster Kleenup International (DKI) — a business network of leading property damage restoration contractors across North America. Since 1981, our outstanding reputation has assured our customers excellence and professionalism in every project.